The lot on which Overton County Public Library stands was once the location of First Baptist Church of Livingston, where my mother was a member, and where my sister, my two brothers, and myself were brought up in, as far as our religious education goes. I remember several of the ministers who served that little church, but probably the most dynamic of those I recall was Clarence Stewart. All children who attended faithfully learned very early that Bro. Stewart was a man who would tolerate no nonsense. I recall that once Harvey Bilbrey was called down right in the middle of Bro. Stewart's sermons one Sunday for making quite a disturbance with a quarter, as he sat in one of the front pews of the church. Harvey had the bench he sat on all to himself, and probably was bored as most young children are while the preaching was going on, so he proceeded to roll the quarter from one end of the bench to the other. When the quarter reached the opposite end of the bench he was sitting on, Harvey would scoot down to that end and roll it to the opposite end. Bro. Stewart tolerated this for a few minutes, and then stopped right in the middle of a sentence and said, "Harvey, are you listening?" That phrase "are you listening" was used on a very regular basis if Bro. Stewart detected attention was beginning to lag on anyone's part, young or old. Henry Geiger broadcast his "Children's Gospel Hour" from that little church during the 1950s. He always announced at the beginning that this program would be heard around the world, and we who were involved felt honored to have our voices going around the world while we sang several songs and then answered questions from Bro. Geiger's Bible quiz. There are probably countless numbers today who attended Geiger's camp at Oak Grove over the years. Bro. Stewart only a few minutes to come skating up behind them, break up the couple, telling the fellow that the members of his group could not skate with outsiders. The young man was heard to say to that girl a few rounds later, "Come back sometime when your preacher ain't along." The carnival always came to Livingston during the summer months, and the caravan had to come right by the church to make the turn onto Windle Street to get to the fairgrounds that were located where Volunteer Foam is now. There were very few buildings that had air conditioning in the 1950s, and the church building was among those. The carnival folks during that period of time included what we called "gypsies", and it was very hard to keep from hanging out the windows to watch as the carnival went by on those occasions. Sometimes, temptation got the best of us and we couldn't resist trying to check out the carnival, in spite of the fact we knew more than likely we would get called down with Bro. Stewart's favorite phrase, "are you listening?" The carnival folks often had a hard time making the turn from the street right by the church onto Windle Street, since cars were parked on both sides for church services, and on those occasions when one of their trucks would get hung up trying to make the turn, we always got a good look at what the carnival was going to consist of that year. We always looked forward to those chances to get a preview of the carnival. and just about everything close by. Needless to say, a lot of us young folks got in trouble that night since it was next to impossible to keep the laughter under control. Bro. 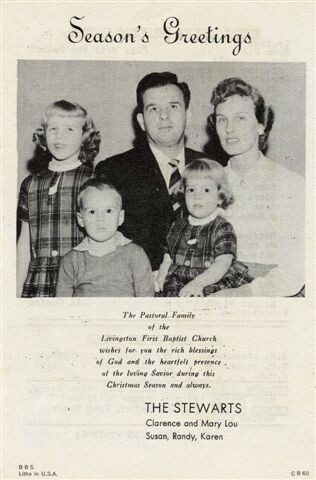 Stewart and his wife, Mary Lou, were loved and highly respected by not only the members of the church they served, but by the entire community during the years they lived in Livingston. I doubt very seriously that any of those who attended First Baptist wouldn't say that both Bro. and Mrs. Stewart left a lasting impression on each life they touched. They were both really good people. Looking back, it seems life was so simple and uncomplicated then. It was a good time to grow up. I'm thankful for the small-town life we had then, wouldn't trade it for anything, or the friendships that were formed during this period of my life.